WASHINGTON D.C. - As of March 2010, 11.2 million unauthorized immigrants were living in the United States, virtually unchanged from a year earlier, according to new estimates from the Pew Hispanic Center, a project of the Pew Research Center. This stability in 2010 follows a two-year decline from the peak of 12 million in 2007 to 11.1 million in 2009 that was the first significant reversal in a two-decade pattern of growth. 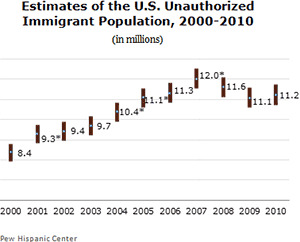 Unauthorized immigrants were 3.7% of the nation's population in 2010. The number of unauthorized immigrants in the nation's workforce, 8 million in March 2010, also did not differ from the Pew Hispanic Center estimate for 2009. As with the population total, the number of unauthorized immigrants in the labor force had decreased in 2009 from its peak of 8.4 million in 2007. They made up 5.2% of the labor force. The estimates are based on data from the U.S. Census Bureau's Current Population Survey, augmented with the Pew Hispanic Center's analysis of the demographic characteristics of the unauthorized immigrant population using a "residual estimation methodology." The report, "Unauthorized Immigrant Population: National and State Trends, 2010," written by Jeffrey S. Passel and D'Vera Cohn, is available at the Pew Hispanic Center's website, www.pewhispanic.org.